When and if I am working on my tan, coconut fragrance will not be acceptable for this Mad Meat Genius. Thankfully there is a product that fits into my meaty lifestyle. 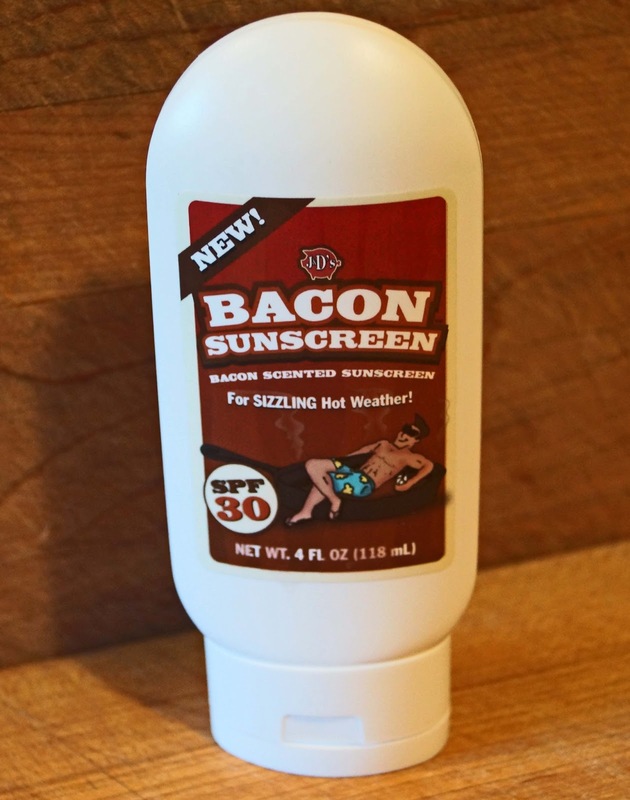 Bacon Sunscreen by J&D Foods is the newest sizzling sunscreen on the market today. A little dab will do you. I wonder why Lucy has been following me around? Umm, Chilebrown, you have a problem...;) Seriously, what does it smell like? Do you attract a cloud of flies? Three Dogs BBQ, Oh Contraire! It is the aroma and nectar of beautiful cured and smoked sow bellies. You will attract every dog and bacon lover in the neighborhood. The cheaper version: just use your regular sunscreen, followed by a nice, moisturizing application of bacon fat. I sleep on bacon sheets. cookiecrumb, Would they allow that in Marin? That is just too much! LMAO picturing dogs following you around on the beach.